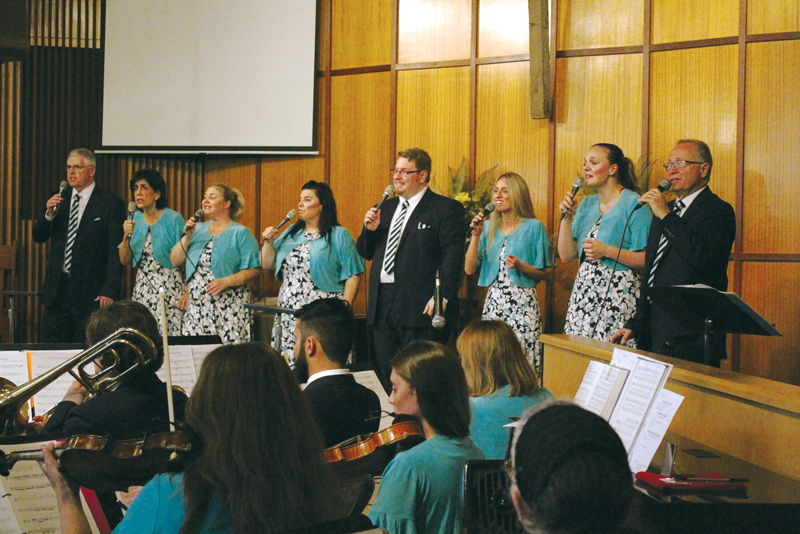 LEMON COVE – Since 1977 Jon Stemkoski and The Celebrant Singers have conducted musical mission trips in all 50 states, all Canadian Provinces, and to countries worldwide. This Saturday, Aug. 11, they return home from their latest outreach amidst the devastation in Puerto Rico as well as a short tour through the southwestern United States. Their Grand Homecoming Concert will begin at 7 p.m. at the L.J. Williams Theatre, 1001 W. Main St. in Visalia. All seats are free, and will be a chance to hear about the work which was done on a trip that almost did not happen if it wasn’t for the community of Lemon Cove. Ten months after Hurricane Maria made landfall as a category 4 hurricane, Puerto Rico is still suffering. Thousands of the territories three million residences have been displaced to the mainland in states like Florida. Those who remain are still without proper food or running water. Only recently power has been restored to ninety-five percent of the island. However, the reliability of the grid is inconsistent, and with hurricane season right around the corner if another were to hit many doubt the grid could withstand another blow. The Army Corps of Engineers and FEMA (Federal Emergency Management Agency) had difficulties getting aid into San Juan, the capital of Puerto Rico, and even more difficulty getting out to the surrounding countryside in the weeks after the hurricane, creating unprecedented logistical challenges for the relief effort. Many communities were left unrecognizable by the storm which could ultimately close down 283 schools. Temporary facilities were set up to accommodate school-age children where schools have already been closed or destroyed. It was in those areas where The Celebrant Singers spent much of the daylight hours of the trip ministering to those who were traumatized by the hurricane, either by losing loved ones or their homes. At night, the group held a concert at some of the venues in the hopes of lifting spirits in the wake of the worst natural disaster in the island’s history. In all, the Celebrant Singers performed 25 shows in 10 days. Reaching out to those in Puerto Rico might arguably be one of the group’s most important outreach efforts, but it almost didn’t happen over a scheduling conflict. The Celebrant Singers have used St. Anthony’s Retreat in Three Rivers to prepare for mission trips over the group’s 40 year existence. The grounds usually house the group for a week as they practice and prep for their journeys but was unavailable this time. Stemkoski called every retreat and camp ground around with facilities large enough to accommodate the large choir and orchestra to practice, but nothing seemed to work out. Just as the group was considering calling off their trip, the community of Lemon Cove answered their prayers. The seeds of good deeds were planted a few months earlier when Stemkoski was driving through the community just east of Exeter. It was a stretch of road Stemkoski had driven thousands of times before, but this time, an open door at the Lemon Cove Women’s Club caught his eye. On his first ever tour of the club’s museum, Stemkoski introduced himself to Karen Barber and a few of her fellow members. He offered to help the women in any way he could, but it was he who would need the help. About that the same time, Stemkoski contacted Ian Hodge, pastor of the Lemon Cove church, in his search for a place to practice. As it turned out, the opportunity to host the singers not only filled a need for Stemkoski, but the church as well. While the two social institutions took care of supplying food and a place to practice, there was still one more need, housing. Neither the church nor the club had enough space to house the singers. That’s where families like Jim and Rae Wohlford stepped in. “I was so honored to be able to do this because they are the ones doing all the hard work,” Rae said. The Wohlfords put up two of the singers, Jane Bedrosian, and Brandy Esajian, but their duties involved a lot more than just providing a place to sleep. Practice for the singers began at 8 a.m. and ran until around 10 p.m. Host families had to provide transportation to and from the church. As Rae tells it there were a couple nights she had to force herself to stay awake. While the group was practicing she did the groups laundry and cleaned their sleeping quarters. Rae even cooked the dress rehearsal dinner on Friday night. Ultimately, it was the kindness of a small town that helped spread the hope of the Gospel to a place that need it the most.